I don’t quite remember the kind of feeling when I traveled without kids. Should be the first couple of years when I got married and went for honeymoon. Nowadays, traveling means having to pack for 4, preferably within 1 big and 1 cabin size luggage plus 1 stroller, at least to keep logistic more manageable. 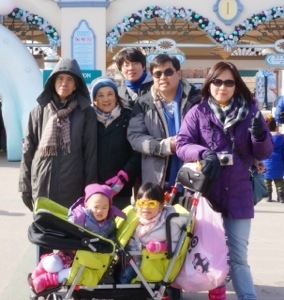 Hubby would also bring his parents along since it’s a family trip. So that means more luggage plus transportation issues. Train transport would be a bit tiring for the old folks and too challenging if we had to handle the luggage, stroller, and the kids. We don’t always get a seat and the grandparents can’t stand for long rides. Normal cabs won’t take 6 people unless jumbo cabs or split into 2 cabs especially in places like Hong Kong where jumbo cars are virtually non-existant? The problem with 2 cabs is sometimes 1 cab goes to the right place, the other goes to the wrong one and we would have to coordinate a meetup. 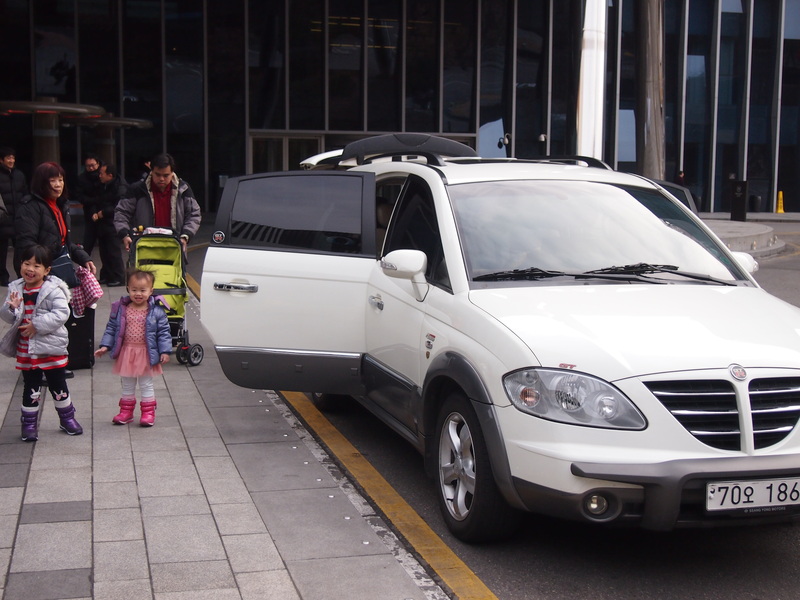 We had no problem getting around in Jeju. Car rental was inexpensive, parking places were plenty and cars on the road were few in some areas. We always have a problem when it comes to Seoul. On our previous trips, we managed to hire an International jumbo Taxi to ferry us around we managed to communicate with them as they can speak some English. For this trip, we didn’t manage to book 1 as our stay in Seoul was longer than previous, and the International Taxi was limited. Hubby did some research and asked around for quotations and we finally settled with This is Korea. They are currently ranked #1 on TripAdvisor so it’s not hard to find them. I was a bit skeptical before the trip when hubby said the reviews on TripAdvisor were fantastic and we should give it a try. My idea was that we could flag/call for a cab when we need, or take shuttle buses or trains on non-peak hours if required. Probably a cheaper alternative. In the end, we settled for a 2 day self-drive and rest of it with This Is Korea. We were very pleased with their prompt response and they really gave us a welcoming feeling with their responses. After a few days with our travel specialist, Michael, this was proven to be a right decision! There are many benefits of traveling with them… Of course, there are areas of improvements too… Ok, about the good points first! Our ride. A spacious Hyundai Starex 12 seater! Michael speaks fluent English and we had no problem communicating with him. He was soft spoken and had a keen listening ear and was able to plan out our itinerary based on what we wanted. He was definitely patient and helpful. Our group moves slower compared to a group of carefree singles or kidless groups. Sometimes the kid wants to go to the toilet just as everyone was ready to set off but Michael was totally cool about it and didn’t stress us to come back as we are late on schedule. He was always ready to help us take group photos with his cool Sony Nex 6. Group photos was something we hardly have as it was not so convenient to get people to help us take all the time. While we were too busy to take photos..
Having a car around was also much more convenient. On some super cold days, the grandparents had a choice to stay in the car while we go explore. For example, on the day we went Insadong, I remember the wind was icy cold and they preferred to stay and wait in the car. Michael would then stay there with them until we return. We also got to eat some really authentic Korean food which is not the usual tourist eateries, which was why I had some difficulties trying to locate and document down those places after coming back. Wish I had taken photos of the shop name. Michael’s service did not stop after the last day of tour with This is Korea. We told Michael during the trip that we really wanted to experience snowfall badly for this trip as the likelihood of snow was quite high this month. So he made some calls to the weather station and told us that the forecast says that there is a high chance of snowfall just 1 day after we were supposed to fly back. After some discussions and planning, we extended our stay as we did not want to miss out the snow if it’s just a day difference. And so, it did snow the next day. And it snowed heavily. In fact, it started with very slight snow late that night when we were supposed to fly. Michael called us up and told us about the snow, knowing we would be very excited to know. And we really were. Late as it was, we dressed the kids up and went out for some snow. It was slight snow but we were thrilled enough. Little did we expect, the snow lasted through the night and the whole of the following day. It was so heavy that thick snow started to accumulate outdoors. And there we build our first snowman with the curious kids. We had fun trying out ice fishing (and getting a free fish that we didn’t fish from the kind Oppa there), seeing the Blue House, picking strawberries and visiting the Garden of Morning Calm. All that we didn’t plan to go. The only destination that we went with some regrets was the Kojinam snow resort. We wanted to visit a snow resort that was toddler-friendly as we couldn’t possibly do snow ski or snow activities, except at most sledding or just snow play. But there was none at the Kojinam resort. The sledding area for the kids was too far away and inconvenient to get too, with lots of staircases around. The grandparents were freezing cold and we couldn’t make it that far. So we left the resort without really doing anything, except experience real coldness. This was one area that we felt Michael could have researched and done better… He was aware that we were looking for a ski resort that could let the kids have fun with snow but there was none! Lucky the real snowfall during our extension made up for that and we brought along our very own ski gloves instead of waiting to rent at the resort. So in a way, he made up that mistake with constant updating us of the snow… ???? Maybe because he is younger, there are some areas where he could have been more attentive, especially with the elderly… There were few times whereby he parked the car very far away and the grandparents had to walk and carry their bags a long way to the car in the shivering cold… Perhaps he thought that the walk was good which was true for the younger us… heh…. but definitely not for the grandparents. Thank you This is Korea for the great service… And we look forward to another trip together with you in the near future!